I started week at TNNA in Columbus. I only went up for one day. I didn't see all that much that was new but it is always fun to see the new products. The main reason I go is to scout out things for Penny to review in Cast On. The most novel thing I saw was some kits that a yarn store in Montana, Camas Creek Yarns, has put together. The owner/designer has managed to get licensing agreements with quite a few universities to do hat, mitten and scarf kits. Brown Sheep Wool has dyed the yarn to match the pantone colors. This interested me as I generally knit something for the kids of friends when they go off to college. Finding yarn the exact color can be very difficult. The kits were very cute. Despite the heat and thunderstorms it was a very pleasant week. I spend some time updating the handout for the finishing class I am teaching in Indianapolis and Charlotte. It is very similar to the course I taught in Mackinac but there is not a workshop at the end of the second day. We will spend that time weaving in yarn tails in different stitch patterns. This was the slowest week I've ever had! I got just one lesson to review and two new students. Summer slow down! The past couple of weeks, the tips were from requests. If you have something you would like me to video, just ask. If it is something that doesn't require a ton of knitting and can be demonstrated in a 4 minute video, I am happy to consider it. (For example, don't ask me to do a video on planning increases on a sleeve, too long and too complicated. So I'm back to finishing tips. This one is for the three-needle bind off. This is probably something most knitters have done. 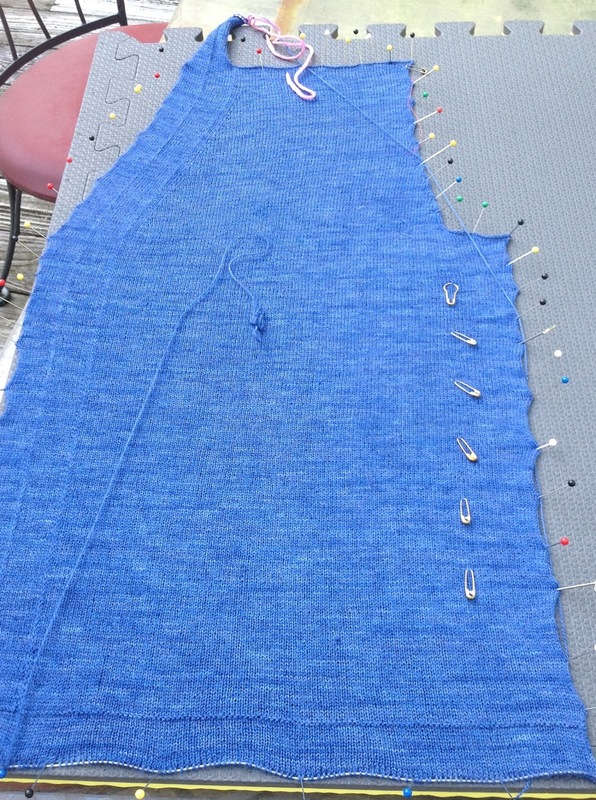 A quick look through patterns will show you that most designers recommend this as a way to seam shoulders. There is a swatch for this in Level 2 of the Masters Program. I am not a particular fan of this technique but I will get to that later. 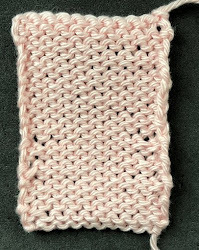 To work a three-needle bind off, the stitches for the shoulders are placed on holders until you are ready to join them. (Before starting make sure you have the same number of stitches on each shoulder.) There are some holders that look like DPN needles. I would recommend these. Invariably if you use the type that look like big safety pins, you will have the stitches oriented incorrectly. 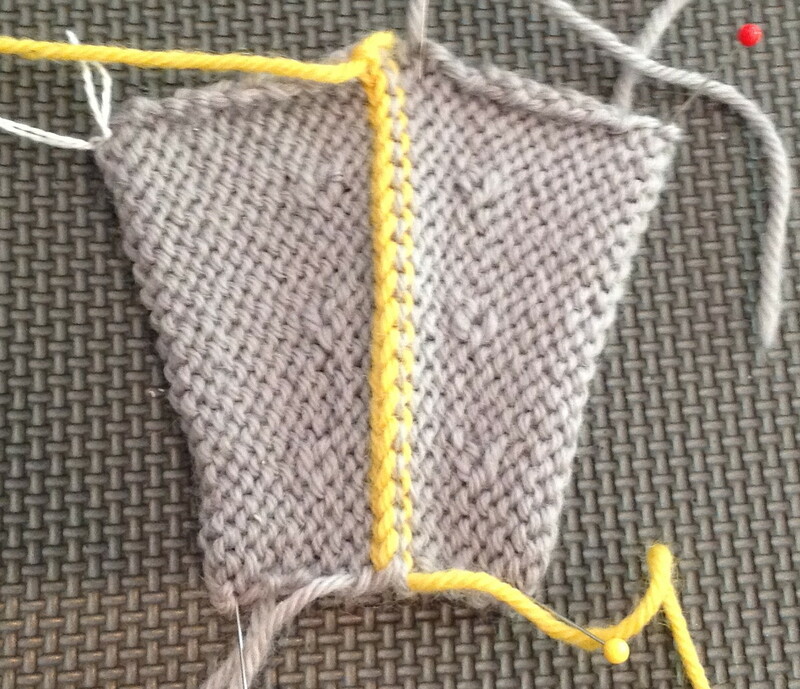 With the wrong sides facing out, and the needles parallel, you knit the stitches on both needles together. You then work a regular bind off. You can see the bound off loops in the photograph below. By the way, these swatches use short rows to shape the angle as if for shoulders. Here is the video: Three-needle bind off. By the way, I apologize for George's appearance in the video. He wanted to help. I rarely use a three-needle bind off for my projects for a variety of reasons. First of all, I always block pieces before finishing. 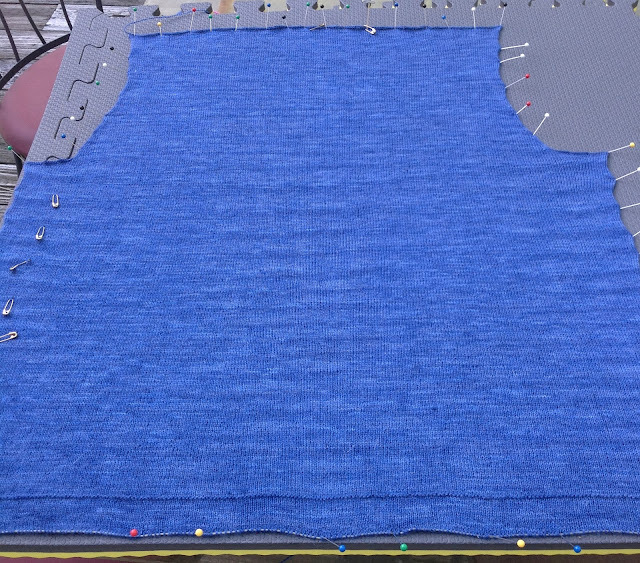 When the stitches are on holders, they can become stretched out during blocking. 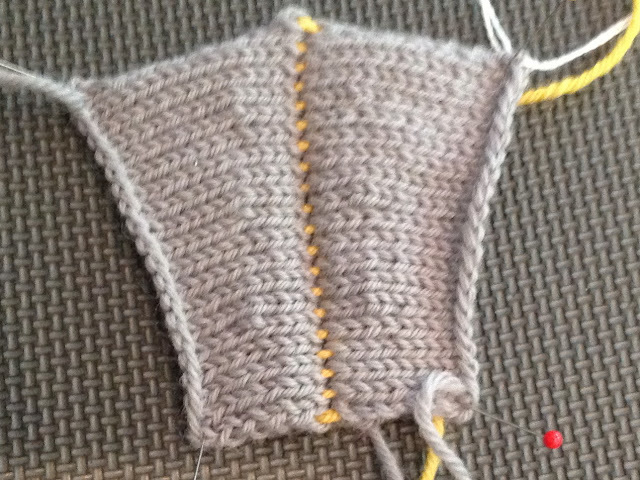 The shoulder seam must be sturdy to hold the weight of the sweater. This is particularly important for heavy sweaters, like Aran sweaters, or drop shoulder sweaters. Next time you work a three-needle bind off, stretch the seam. Notice that it has quite a bit of give. Picture this seam supporting a drop shoulder sleeve worked in a dense stitch pattern with worsted weight yarn. The only time I use a three-needle bind off for shoulders is on baby sweaters. They have such big pumpkin heads, you need all the give you can get. Why is this such a popular finishing technique? You don't need a tapestry needle. Many knitters are into quick finishing. Just look at the titles of many books and you will see what I don't mean. I don't mind finishing and I don't panic when I have to use a tapestry needle so I generally seam shoulders. Stretch a shoulder seam and you will see there is very little give. Again, this is a personal preference of mine so I will get off the soap box now. I finished up the left front of the sweater. I've blocked it. I need it to plan for the buttonholes for the other front. (See, I practice what I preach!) The front bands fold over so there will be two buttonholes for each button. I spent quite a bit of time swatching trying to decide what type of buttonhole to work. I finally decided vertical buttonholes will work best. I generally do some form or an eyelet or a one-row horizontal but the yarn tails from the vertical buttonholes will be useful for reinforcing the two buttonholes together. The bottom bands are a provisional cast on worked directly onto a needle cable. When the sweater is finished I will graft the band to the sweater body. The front bands have mitred corners which I've just noticed don't appear in the photograph. When it is finished I will be sure to do a close up. I am putting that project on hold to do the coat for the Winter issue of Cast On. It is a cabled swing coat. I'm calling it the Caduceus Coat. There will be a cable motifs which resemble a Caduceus. It took a bit of time to design this thing. I've learned over time it is best to consider ALL sizes when working the sample. It is really hard to back track for sizes. This coat required charting out the entire length (approximately 40" long). The loops on the caduceus get smaller. In this photograph, the color looks like a dark pink but it is really a deep red. It is Rowan Kid Classic in Cherry Red. One downside for me of the three-needle bind-off with the seam on the wrong side is that you get a line of stitches showing on the front, as highlighted by the yellow yarn used in the example. Also, the stitches don't align visually because they are meeting head to head (if you want it to look like unbroken fabric, you need to graft, offset by half a stitch). For these two reasons, I only use the three-needle bind-off for exposed seams. It makes really nice exposed seams! Otherwise I graft, or do a modified three-needle bind-off, which creates a nice chain stitch along the seam.